• OVER 50 OF THE MOST POWERFUL OFF-ROAD CARS EVER BUILT - Tear through environments with an iconic roster of historic and modern-day rally cars, VW Polo GTI R5, Mitsubishi Lancer Evolution X & Citroen C3 R5. Also take on the challenging power of the Chevrolet Camaro GT4.R. • 6 REAL LIFE RALLY LOCATIONS -Take the wheel through the stunning environments of New Zealand, Argentina, Spain, Poland, Australia and the USA. • FEEL YOUR RACE - Improved handling, surfaces, fallibility and environments deliver the most authentic and focused off-road experience ever. • THE OFFICIAL GAME OF THE FIA WORLD RALLYCROSS CHAMPIONSHIP - Race at Barcelona, Montalegre, Mettet, Lohéac Bretagne, Trois-Rivieres, Hell, Holjes and Silverstone in a multitude of different series. • DEVELOP YOUR OWN TEAM - Create a team, hire your staff and expand your garage of vehicles as you choose. • TUNING - Tune your vehicle to suit your driving style and environmental characteristics. Alleviate wear and tear by configuring each car's set-up, and upgrade your parts to ensure your vehicles are ready for whatever challenge lies ahead. 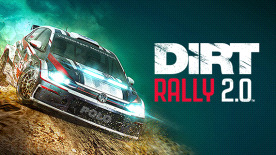 • GET COMPETITIVE - Race the entire DiRT Community in Daily, Weekly and Monthly Challenges, with worldwide leaderboards and events. © 2018 The Codemasters Software Company Limited ("Codemasters"). All rights reserved. "Codemasters"®, "EGO"®, the Codemasters logo, and "DiRT"® are registered trademarks owned by Codemasters. "DiRT Rally 2.0"™ and "RaceNet"™ are trademarks of Codemasters. All rights reserved. Under licence from International Management Group (UK) Limited.All other copyrights or trademarks are the property of their respective owners and are being used under license. Developed and published by Codemasters. Unauthorized copying, adaptation, rental, lending, re-sale, arcade use, charging for use, broadcast, cable transmission, public performance, distribution or extraction of this product or any trademark or copyright work that forms part of this product is prohibited.